Earth is infected with a deadly Ori plague, prompting an ally from SG-1's past to come to their aide. Gerak proposes that the Free Jaffa follow the Ori religion. SG-6 has returned from a long-term undercover mission to P2X-885. The world is the third planet to convert to Origin in a month. On Dakara, Yat’Yir informs Gerak that his visitor has arrived. It is a Prior, originally the administrator of the Ver Egen village on Celestis. Gerak says he has read from the Book of Origin and has found it is everything his people need. In time, all Jaffa will see Origin as their true faith. Colonel Carter briefs General Landry on a project she and Dr. Lee have been working on with the information taken from the encounter with Khalek, Anubis’s engineered clone. They believe the knowledge they have collected may be enough to create a weapon that will disable a Prior of his abilities. Later Carter returns to the lab to continue her work, unaware that she is being watched by a powerful presence. Gerak goes before the council to share his opinion on Origin and his wishes to legislate the beliefs into law. Under his plan, all Jaffa children will be raised in worship of the Ori. Teal’c has heard the news and meets with Bra’tac, who admits that many of the council are old. Because the Ancients have done nothing, many will see Origin as the only way of truly achieving enlightenment. Colonel Barnes of SG-6 has come down with high fever, chest pain and respiratory distress. He has been infected by a Prior plague. Lieutenant Fischer listens to Lieutenant General George Hammond’s speech at an air base, and before he can get near to meet him officers in hazard suits cram him into the back of a van and return him to Stargate Command. Soon twelve officers are infected, and only half have come in contact with SG-6. Fischer, now in isolation, explains that he attended morning Prostration with Airman Ryan. A Prior was there and walked among them, blessing them. Apparently he was aware of the presence of humans from Earth, and made Fischer the carrier of the plague. This is why he himself is not sick. Fischer stopped at a restaurant and gas station where he used a self-service pump. Not knowing how bad the damage is, Colonel Cameron Mitchell is sent into the public to help quarantine. IWN and other news sources are soon having a field day, as symptoms begin to sprout in Utah, Kansas and New Mexico. Teal’c uses a M.A.L.P. to inform Landry of the updates on Dakara. According to his sources the council is swaying toward legislating Origin. Carter and Dr. Lee are getting closer to an answer, but sleep deprivation is weighing heavily on them. When Lee goes to get coffee, Sam is alone. She hears a voice behind her and turns. A young boy stands where no one was before. “Who are you,” she asks. Lam confirms that he is human, and says the reasons he fell in the form of a child his plausible. A child’s human mind can contain far more information for a longer period. He became a boy to preserve as much of the Ancient knowledge as possible. In a briefing, Orlin reveals the truth about the Ori. Their offer of ascension and enlightenment is entirely false, because if they were to ascend their believers, then they would have to share the very energy they consume from them. Every believer who has given up his or her will to the Ori transfers their life force to the ascended beings. Only large multitudes of followers generate a detectable energy transfer. Orlin informs them that the Milky Way galaxy succumbing to the Ori would tip the balance dangerously in their favor. Gerak meets with the Prior, who instructs him to travel to Chulak, where Teal’c and other dissidents are convening. He is to offer Origin to them one last time, and if they refuse, Chulak will be annihilated. Despite the pleas from Yat’Yir, who last a cousin on Kallana, Gerak intends to carry out his mission. Orlin intends to use what is left of the Ancient memory of his mind to construct a viable cure for the Ori plague using Earth computers. Unfortunately a toaster will not do the trick. His task will be far more complicated than constructing a miniaturized Stargate. Carter and Orlin go to the commissary for lunch, where the fallen Ancient explains that despite his appearance, he still has his feelings for her (though human social conventions will prevent them from sharing those feelings). Soon Orlin begins to repeat his conversation topics, and Carter realizes he is not making jokes. Something appears to be wrong with his mind. There are now five thousand confirmed cases of infection, with the bulk being in the Colorado Springs and Denver areas. Eight have died, five being S.G.C. personnel. The number of fatalities will rise quickly. There is a speck of good news, however. Dr. Lee has completed the anti-Prior weapon. With intelligence from the Sodan, Colonel Mitchell and Daniel Jackson will lead a team to P9G-844 to capture the original Prior who spread the illness on 885. Orlin believes the root D.N.A. code will help him finish building the cure. Now with the anti-Prior weapon, they may just have a chance. Gerak warns Teal’c and Bra’tac that he will not hesitate to destroy the countless innocents who continue to remain free and independent, but at the last moment he is unable to use his ship to destroy them. Back on Dakara, the Prior is enraged at him. Still sensing Gerak’s doubt, the Ori bring his mind to the city of Celestis, where he is given an audience with the Doci. Lam shows digital readouts of Orlin’s brain. His attempt to hang on to as much Ancient knowledge as possible is beginning to result in permanent brain damage. Jackson, Mitchell and several military officers have arrived on the Sodan homeworld. Several minutes into their patrol they are captured by the Sodan. Landry reads a report from the President’s desk. Since the morning 8,000 people have become infected in 13 states. The President has ordered the country entirely under quarantine. Ka’lel insists that no decision about the ratification of Origin into law be made while members of the council are missing. But a Prior arrives to ensure that all Jaffa will indeed bow down to the Ori. Gerak has been converted to the Ori religion, and vows to spread the word of Origin to all Jaffa. The Prior acknowledged that the Goa’uld, who once enslaved the Jaffa, are evil — but convinced Gerak that the Ori offer the good that is the spiritual alternative to that evil. Gerak has proposed to the High Council that the religion of the Origin be accepted as the Free Jaffa’s official religion, to be taught to their children, its benedictions and traditions to be followed to the letter. Should it be ratified by the Council, all Jaffa would be required to accept the Ori as gods. The Council is leading towards accepting Gerak’s proposal, according to Teal’c’s intel. Gerak is the first Jaffa to formally embrace false gods in the Ori, or any other religious system to replace that imposed by the overthrown Goa’uld. He believes they are the true gods that Jaffa have been seeking for generations. Gerak’s threat to attack innocent Jaffa on Chulak is despicable for a Free Jaffa. For countless years their oppressed movement has existed to cast off slavery to false gods and to determine their own fate. Now that they have accomplished this monumental task, Gerak — their leader — is threatening to install a new religion by force. His goal is not self-determination or religious freedom, but rather the full adoption by all Jaffa of that religion that he alone has determined to be true. Yet Gerak’s embracing of Origin is not inexplicable. The Ori promise enlightenment and ascension — something the Jaffa have been seeking for centuries. This is why Kheb is a holy place to them, where it is believed that Oma Desala once helped dying warriors to ascend (“Maternal Instinct”). Ascension is viewed as the afterlife following a life of a deserving warrior. According to Bra’tac, the promise of eternal life in ascension is a key element of Origin that has swayed Gerak and other aged Jaffa leaders. The Book of Origin also includes a story of a false serpent god who was overthrown, which Gerak believes may be prophetic of the downfall of the Goa’uld and the salvation of their slaves by the Ori. The Prior plague from P8X-412 (“The Powers That Be”) was used on P2X-885, and brought back to Earth by SG-6, on that planet under cover. This strain has a different genetic make-up (which is why it went undetected when Dr. Lam cleared the men following their return to Earth). Stargate Command was unable to contain the rapid spread of the Ori plague. It is airborne and persistent, and spread beyond Colorado Springs and even the state of Colorado within a few days to become an uncontained public outbreak on Earth. The U.S. government’s cover story for the Prior plague is that a new influenza strain has appeared, showing up first at St. Francis Medical Center. This story may not hold up well if thousands of U.S. citizens begin dying while no cure can be found. There are 5,000 confirmed cases of the plague in Colorado alone, and eventually over 8,000 in 13 states. Eight people are dead so far, five of whom were S.G.C. personnel. The President has ordered the United States under quarantine. Neither Daniel nor Cameron have fallen victim to the Ori plague, though they were among the first people to encounter SG-6 when they returned to Earth. It’s possible that someone who has been infected and cured (including Cameron in “The Powers That Be”) cannot be reinfected. The disease is similar to the one that infected Sam and Teal’c in the Antarctic (“Frozen”). Daniel may be immune because he has been ascended; he did not come down with the disease in “The Powers That Be,” either. The opposition of Teal’c and Bra’tac to Gerak’s proposal that the Free Jaffa follow Origin may lead to a Jaffa civil war — something not unexpected following any war for independence. On Chulak they sought more Jaffa leaders who would support them in their opposition. They have resolved that they will not consent to any alliance with the Ori, no matter what the High Council decides. Carter was able to sense Orlin’s presence before he showed himself to her, to some degree — possibly because of her previous “intimate” experience with him (“Ascension”). Sam’s report indicated that she and Orlin had an “intimate” relationship. There is no indication that she ever slept with him, as she rather insisted that she did not return his romantic feelings (“Ascension”). More likely she refers to the moment where they shared spirits in an ascended ritual. Orlin chose to descend as an adolescent boy. Having a younger brain gives him a slightly better chance at retaining more Ancient knowledge, in order to help Earth fight the Prior plague. But ultimately he will lose most of the knowledge he had when he was ascended. Orlin believes the Ancients let him descend without wiping his memory because enough of them thought someone had to “step out of line” to warn our galaxy about the Ori, who they are, and what they are really after. It is therefore unlikely that Earth will suffer the same fate as the last planet that Orlin helped, Velona: the Ancients themselves destroyed it. This is a rare indication that the Ancient’s non-interference rule is somewhat flexible. Daniel was also allowed to return to his mortal form, without his memory being wiped, after Oma Desala sacrificed herself to stop Anubis (“Threads”). Originally the Ori and Alterans were originally one society, human, on an evolutionary path to ascension. But a philosophical division grew: the Ori grew fervent in their religious belief. The Alterans, for lack of a better way of putting it, believed in “science.” The Ori eventually tried to wipe them out. Instead of going to war the Alterans built a ship and left their home galaxy, first coming to ours (“Avalon, Part 2”) as a direct result of this conflict. This is not necessarily to pit science against faith, that there is no spiritual / religious component to the Ancients or a scientific / technological component to the Ori way of life. It points more to the fact that the Ori saw their impending ascension (and mastery of technology like gate travel, more than likely) as worthy of respect and worship from other, less-advanced life forms, while the Ancients believed that they have no right to “play gods” and thus create a religious system with themselves at the center. As Daniel observed in “Abyss,” the Ancients operate toward humans the way they do because they believe that no one has the right to play god. The Ori ascended and presumably created the second evolution of humans in their galaxy (just as the Ancients did in the Milky Way and Pegasus Galaxies), passing on their religious beliefs as “Origin.” But the central promise of Origin is a lie, according to Orlin: they do not help their human followers to ascend. They sap energy from those who worship them, which continues to empower them. It is a complicated process that is only measurable with massive numbers of humans relinquishing their will, according to Orlin. Allowing others to ascend and join them would require the Ori to share this influx of power. The Ori empower themselves by sapping the life force of those willing to surrender themselves to them. These followers die deaths of the most meaningless kind, the Ancients believe, because there is no conscious effort to achieve enlightenment; they hope to have it handed to them in exchange for their worship. Not even the Priors know this is the case. And the more worlds the Priors convert, the more powerful the Ori become. The Origin religion apparently exists to increase the Ori’s power. They do not simply believe philosophically that they are worthy of worship because they have ascended to a higher plane; they enforce this in order to gain more power from lower beings. This is one of the main reasons why the Ancients follow a strict non-interference directive with the lower planes. Manipulating mortals could lead to this same sort of abusive corruption, where ascended beings use lower life forms for their own gain. It is interesting to compare the Ori to another enemy of the Ancients: the Wraith. Both species extract life force from their victims, though in very different ways. The Ori apparently leave their victims alive to live a full life of devotion to them and die at a natural age, their worship serving as a steady trickle of life force. But the Wraith physically extract life force from a victim, rapidly aging him or her to the point of death. The Ancients will not act to stop the Ori and their Priors because it is not certain whether they could win — or whether doing such a thing would be of any value to them as they seek further enlightenment. But the Ancients do believe that if our galaxy were to succumb to the Ori, “it would be very bad for everyone” — likely themselves included. The Prior who infected SG-6 (and thus Earth) is the same one who has visited the Sodan, a mythical tribe of Jaffa recently encountered by SG-1 (“Babylon”). It is believed that he manipulated his own DNA to create the virus. The Prior’s staff can accomplish the same thing as the Ancient long-range communication device. Though a person’s physical form (in this case, Gerak’s) remains where it is, his consciousness is sent to the distant Ori galaxy. It is possible that they inhabit the physical body of someone there, as Daniel and Vala did when they used the Ancient device, in order to give those in the distant galaxy (such as the Doci) someone with whom to interact. The Jaffa Ka’lel may be something of a moderate, and appears to be leaning toward opposing Gerak’s proposal. She implies that the High Council should not vote to ratify Origin as the official religion of the Free Jaffa Nation until (and unless) all Jaffa wish to embrace the Ori — a fair but obviously impossible standard for Gerak and his supporters to meet. Gerak, the leader of the Free Jaffa Nation, has been transformed into a Prior. The Priors view this as a personal demonstration of the power of the Ori, which they hope will overwhelm Gerak and push him beyond his uncertainty. Conversion into a Prior certainly includes some measure of brainwashing. Gerak’s metamorphosis included the loss of his forehead mark and the healing of that wound. The scarification on his face also appears gold, implying that the gold from the forehead emblem was melted and re-situated on his face — indicative of how service to the Ori is in many ways little different from enslavement to the Goa’uld. The transformation of a human into a Prior of the Ori can take place even over the vast distance between galaxies — very likely through the Prior staff itself. Gerak’s physical body remained in our galaxy when his consciousness visited the Doci at Celestis, yet his mind and body were both transformed by exposure to the Ori. Earth scientists have studied Khalek enough to devise a weapon to use against the Priors, who are evolutionarily advanced human beings. The device, developed by Dr Lee and Lt. Colonel Carter, is a frequency generator that emits an omni-directional ultrasonic field in fluctuating frequencies. In theory it prevents the Prior from accessing the highly advanced part of his brain that gives him extraordinary abilities. Lee also hopes it will interfere with a Prior’s connection to his staff weapon. It has multiple frequency ranges, in case one does not work. It has not yet been tested. Colonel Mitchell’s time on the Sodan homeworld (“Babylon”) lasted two weeks. Samantha Carter – Carter once again faces a seemingly insurmountable problem threatening the people of Earth, this time in the form of the Prior plague. This time she knows that she can’t solve the problem, and relies on her once ascended friend Orlin to help save them all. She certainly has personal (but not romantic) feelings for him, and is still uncomfortable with his expressions of love for her — especially now that he is in the form of a young boy, and not a full-grown man. Orlin – Orlin once again gave up ascension to become mortal — but this time not just for Samantha Carter, but to warn Earth and help save them from the deadly Prior plague. He chose to descend as a young boy in order to retain more of his Ancient knowledge, even though this meant that because of human social conventions he could not renew any kind of romantic relationship with Sam. This descent to human form was probably a one-way trip for Orlin. He believes that the Ancients probably won’t help him ascend again — which may not be true, since many of them believe that what he is doing had to be done. He is also suffering brain damage and acute memory loss as tries to hold on to his Ancient knowledge. Gerak – Unbeknownst to other Jaffa leaders, Gerak has been consulting with a Prior of the Ori and studying the Book of Origin. He has now converted to Origin, and is advocating that the Jaffa High Council adopt it as their people’s official religion. To many this is a betrayal of the most profound kind, trading one set of false gods for another; but to Gerak it is embracing true religion after having escaped falsehood. Gerak has become convinced that the Ori are true gods — or are so powerful in their ascension that they might as well be — and deserve his people’s worship. Gerak spared the lives of Teal’c and those on Chulak when they refused to convert, disobeying the Prior’s commands. Now, he has been turned into a Prior himself, and is no doubt more fully under their control. Yat’Yir – Yat’Yir lost a cousin in the battle at Kallana. Till now he has viewed the Ori as an enemy of the Jaffa, and took much convincing from Gerak to believe that Origin was a wise choice for the Jaffa people. But he has come around, and is willing to follow Gerak on this path. Carolyn Lam – Dr. Lam is now faced with the biggest challenge of her career: an alien plague that she has diagnosed has reached Earth, and the general population. And she is helpless to do anything about it. It is not widely known on the base that Dr. Lam is General Landry’s daughter. Teal’c – Bra’tac is apparently a member of the Jaffa High Council, though he has been absent as of late. Like Teal’c, he opposes Gerak’s motion to follow the Ori religion, believing it to be a compromise of all that for which they have fought. George Hammond – General Hammond has likely retired, based on his dress at his speech to an official gathering at Peterson Air Force Base. But he is still involved with the Air Force to some degree, as the speech demonstrates. When did Gerak meet the Prior and receive the Book of Origin? For how long has he been considering conversion, after previously opposing them so vigorously (“Origin,” “Beachhead”)? Why did Daniel and Cameron not fall victim to the plague? They were the first people that SG-6 met after returning to Earth. Are they immune? Will the Jaffa High Council vote to accept Origin? If so, will Teal’c and Bra’tac really instigate a civil war? How will his transformation into a Prior affect Gerak’s mind and values as a Free Jaffa? Now that Gerak is a Prior, will he return to Chulak to attack the people there? Will Orlin survive? Is his current work enough to create a cure for the Ori plague once a blood sample from the Prior is retrieved? Why did the Sodan receive Colonel Mitchell and the others in such a way? Have they now fully embraced Origin? Will the government’s cover story of a new flu strain hold up? Will a cure to the plague be found? Do the Priors know that Earth has become inadvertently infected with their plague — or did the Prior know that Fischer was from Earth and deliberately use him as a carrier? Will they come and demand our conversion now? Can a Prior be “converted” with the new information from the Ancients that the Ori’s promise of ascension is a lie? Or are they brainwashed beyond redemption? It was initially hoped that actor Sean Patrick Flanery, who originally played the character Orlin when he was introduced in Season Five’s “Ascension,” would be able to reprise the role in this episode. Due to the actor’s unavailability, the character was rewritten to be a 12-year-old version of Orlin. The producers told GateWorld that they also considered rewriting the part to be a different Ancient altogether. “That was supposed to be General John Jumper who is the real Chief of Staff of the Air Force right now. I was in Vancouver at that point filming something I’m working on in L.A. now. And I had to come up, I had a recurring role on a series called The Dead Zone, I don’t know if you have that over here. I was up there filming that and filming a horror film called ‘Beneath’ and there were three days that I had off between the two projects and when General Jumper couldn’t come to do, the Stargate people called and said Don would you come over and do it, so I did. I owe them a lot and when I can help them, I do. “When we broke this mid-season two-parter, we fully expected to have actor Sean Patrick Flanery reprise the role of Orlin. Unfortunately, it turned out he was unavailable for both episodes. As a result, we were forced to rethink his character’s role in the story. In retrospect, it was different but ‘good’ different, offering up some terrific opportunities for both the Orlin character and Samantha Carter. 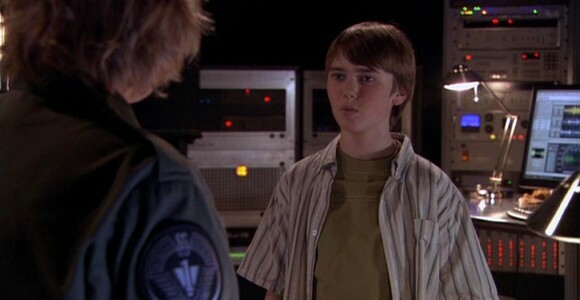 The part ended up being played by Cameron Bright who has gone on to play the role of Alec in the Twilight Saga. VOTE! How would you rate SG-1's "The Fourth Horseman, Part 1?"